AUTONOMY is a nine-scene theatrical extravaganza that ushers its audience from scene to scene while immersed among 40 vintage and unique cars, 17 actors, 160 wheels, 320 cylinders, thousands of horsepower and 70,000 square feet to tell an intimate tale that revolutionizes transportation that could save our planet. Set in 2022 at the outset of the AV transportation revolution, Gabby, a techno-nerd teen dreamer, loses her Over The Road truck-driving father and avenges his demise. With ICE, Amazon, Google and Karl in pursuit, Gabby tests whether lives can be saved by precise technology or human intervention or both. Intimate groups depart every ten minutes for two hours, winding through the snaking path of this environmental thriller, hearing the scenes through ear buds and getting a tour through Detroit and Silicon Valley as they whiz through this car-based play. Says Director Jack Reuler: "AUTONOMY is the most ambitious show of Mixed Blood's 43 years, in content, form and production. Autonomous vehicles are coming and will revolutionize transportation in ways more radical than the invention of the car itself. 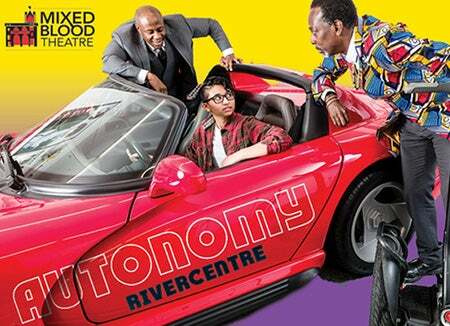 AUTONOMY celebrates America's love of car culture, environmental activism, theatrical storytelling, rock concerts and amusement park rides while following the intimate tale of a fatherless child." From an Isetta to a Lamborghini to a BMW Z1 to a Bricklin, viewers will gape at butterfly doors, gull wing doors, sliding car doors, suicide doors and the entire front of the car opening. Low riders, Teslas and other electrics and amazing flame paint jobs join celebrity cars such as the Batmobile, the Back To The Future DeLorean, Scooby Doo's van, Austin Powers' Jaguar XKE and rarely seen Amphicars and Zimmers. Generations of Corvettes and automotive albatrosses like the Edsel, Corvair, Pacer and Gremlin flank an evolution from the Holden Ute to the Chevy Cameo and El Camino to the Ford Ranchero and Subaru Baja. There just might be a comic cameo by the Oscar Mayer Wienermobile, Planter's Nutmobile and Red Bull Mini Cooper! Ken LaZebnik is a playwright, author and screenwriter, heading a LA-based MFA program in screenwriting. He has written for Touched by An Angel, Star Trek and A Prairie Home Companion. AUTONOMY marks the seventh play by Ken LaZebnik produced by Mixed Blood, preceded by African Jazz, Calvinisms, League of Nations, Vestibular Sense, Theory of Mind and On The Spectrum. The cast includes Mixed Blood veterans Ansa Akyea, Harry Waters Jr., Malachi Caballero, Raul Ramos, Taj Ruler, Randy Reyes and Michael Laskin. Mixed Blood aspires to be the destination for people with disabilities. Patrons with disabilities are eligible for complimentary advanced reservations and complimentary transportation to and from Saint Paul RiverCentre. Please contact Mixed Blood regarding specific requests for accessibility at [email protected]. Mixed Blood Theatre has invited the global village into its audience and onto its stage for its unique brand of provocative, inclusive, and predictably unpredictable theater since 1976. Using theater to illustrate and animate, Mixed Blood models pluralism in pursuit of interconnections, shared humanity, and engaged citizenry.